As if we needed another excuse to drink more coffee, it turns out that our morning cup of joe has many proven health benefits. 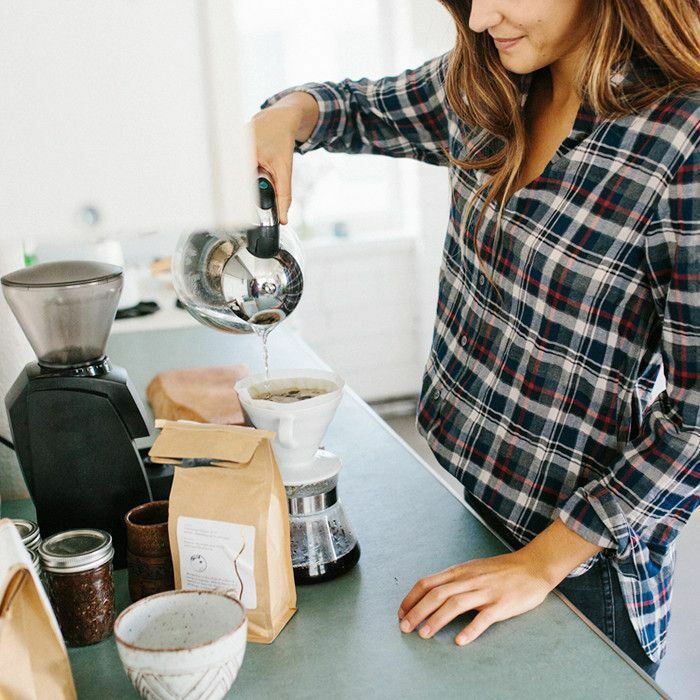 To help us capitalize on coffee's preventative health properties, like its ability to reduce the risk of Parkinson's disease and its role in protecting against type two diabetes, we reached out to Isabel Smith, RS, MD, CDN, and Maria Bella, registered dietitian and founder of Top Balance Nutrition, for some extra-healthy coffee recipes. According to Bella, "Coffee is one of the highest sources of antioxidants in the Western diet." She further adds that it "has a ton of health benefits and almost zero calories when taken black." As most people might prefer their coffee with a little cream or almond milk, Bella and Smith have come up with a few recipes to exploit the magic bean's many healing properties. So what are you waiting for? Scroll down to find the nutritionist-recommended coffee recipes that just might become your new signature beverages. According to Bella, half of your coffee can be "counted towards your hydration for the day." To really up your hydration while also getting the antioxidant and energy benefits from coffee, try adding coconut water. Bella recommends the following recipe: one cup of Harmless Harvest Coconut Water ($5) with half a cup of coffee concentrate over ice. Not only does this recipe incorporate polyphenols (aka the antioxidants in coffee) that are proven to reduce the risk of various cancers and cardiovascular disease, but the coconut milk also provides electrolytes that are beneficial for muscle and nervous system health. Want an energizing, heart-healthy, detoxifying, and immune-boosting morning beverage? Smith's got you covered with this all-around healthy smoothie, which is made up of one banana; one serving of organic instant coffee, like Mount Hagen Organic Instant Coffee ($20); one handful of kale to help naturally promote the production of detoxifying enzymes; one scoop of plant-based protein like Philosophie's Green Dream ($15); one tablespoon of cocoa powder, which Smith says is "good for brain and heart health;" eight to ten ounces of hemp or coconut milk; and one pinch of bee pollen, as Smith says it is "good for the immune system." If you're thinking this drink couldn't get any better, think again, as Smith adds that the coffee, protein powder, and full banana will not only make you feel satiated, but they will also provide a major boost of energy. Which, if you are anything like us, is much needed in the morning. For a brain-boosting and heart-healthy recipe, Bella recommends drinking the following smoothie: half a frozen banana, one cup of raw spinach, half a cup of frozen blueberries, half to one cup of iced brewed coffee, half an avocado, and one tablespoon of chia seeds. According to Bella (and quite a few studies), the caffeine in coffee "helps to improve your cognitive function on the daily basis," and the heart-healthy fats from the avocado and chia seeds as well as the antioxidants from the spinach and blueberries will "give your immune system a huge health boost while protecting your heart from cardiovascular disease," says Bella. Want more healthy morning beverage recipes, check out these six beauty smoothies for a more radiant complexion.